DD Form 2792, Family Member Medical Summary is a form issued by the Department of Defense (DoD) and used for enrollment in the EFMP and for recording a family member's special need for medical services. This form - often confused with DA Form 2792 - was previously reviewed in August 2014 with all previous editions being obsolete. An up-to-date fillable version of the DD 2792 is available for download below or through the DoD Documentation website. What Is DD Form 2792? The information provided in the Family Member Medical Summary will help the military assignment personnel determine how the dependent's special needs may be met in accordance with the availability of medical services at a particular duty station. The form is a part of a paperwork package necessary to enroll into the Exceptional Family Member Program - or EFMP for short - and for the Family Member Travel Screening Process along with the DD Form 2792-1, Special Education/Early Intervention Summary. Despite being issued by the Department of Defense, DD Form 2792 and DD 2792-1 are required for EFMP enrollment for service members of all branches. How Often Should I Update My Dd Form 2792? Where To Go To Get A Dd Form 2792 Filled? the family. Mark (X) all services being provided to the family member. family member with special medical needs. has been reviewed for completeness and accuracy. forms are completed and attached before signing. the MTF coordinator/authorized reviewer signs block 12b. EFMP program, telephone number, and official stamp. Self-explanatory. practice and their state licensing requirements. remainder of the information on the appropriate attached addendum form. corresponding diagnostic code for the family member. the family member identified in Item 2.a. Items 2.c. - e. Self-explanatory. member is enrolled in DEERS. admissions, and number of outpatient visits. participation of family members, and if treatment is ongoing. Items 2.h. - j. Self-explanatory. Items 7. - 21. Secondary Diagnoses. Follow procedures for Items 2. - 6. Items 3.a. - h. All items refer to the sponsor. Self-explanatory. the sponsor. If the family member does not, then provide an explanation. complete Items 4.b. - e.
Item 5.a. - d. If Yes, enter SSN, name of sponsor and branch of Service. Item 6.a. If Yes, complete b. - c. Self-explanatory. Items 23. - 26. Self-explanatory. and model of the equipment. Item 8. Required Actions. Self-explanatory. addendum is completed only if applicable to the patient described. is completed only if applicable to the patient described. school-based team that diagnosed the patient. Provider is REQUIRED in Item 5.b. Items 2. - 3. Self-explanatory. Items 2. - 4. Self-explanatory. the frequency taken, and the reason prescribed. diagnosis (to include attention deficit disorders). dosage, and frequency for diagnoses listed in Item 1.a. item 13 if more space is required. diagnosis(es), with reasons for discontinuing, and the frequency taken. Items 10. - 11. Self-explanatory. Item 13. General Comments. Self-explanatory. YEARS (include the date of last admission). Items 6. - 9. Self-explanatory. AUTHORITY: 10 U.S.C. 136; 20 U.S.C. 927; DoDI 1315.19: DoDI 1342.12; and E.O. 9397 (SSN) as amended. may be found at http://dpclo.defense.gov/Privacy/SORNSIndex/DODComponentNotices.aspx. duty assignment. Dependent special needs are annotated in the official military personnel files which are retrieved by name and Social Security Number. sponsor may be held accountable for the accuracy and completeness of the DD 2792 and addenda and should review all pages prior to signing on page 2.
the sponsor's proposed duty locations. community office responsible for supporting families with special needs, if EFMP enrollment criteria are met. c. The authorization applies to the summary data included on the medical summary form, its addenda and subsequent updates to information on this form. responsible for care or services. Summary data may be transmitted (e.g., faxing or emailing) using authorized secure media transfer. Start Date: The authorization start date is the date that you sign this form authorizing release of information. is the sole purpose for the completion of the form. the basis of this authorization. My revocation will have no impact on disclosures made prior to the revocation. regulations, then such information may be re-disclosed and would no longer be protected. treatment facility to release the information described above for the stated purposes. coordinate accompanied assignments prior to OCONUS travel may result in ineligibility for TRICARE Prime status (does not pertain to civilian employees). e. Failure to release this information or any subsequent revocation may result in ineligibility for accompanied family travel at government expense. f. Refusal to sign does not preclude the provision of medical and dental information authorized by other regulations and those noted in this document. b. IF YES, UNDER WHAT SSN? 6.a. DOES THIS FAMILY MEMBER RECEIVE CASE MANAGEMENT SERVICES?
. Do not submit a blank addendum for EFMP review. 11. CERTIFICATION. DO NOT CERTIFY BEFORE THE MEDICAL PROVIDER COMPLETES THE ENTIRE FORM AND ADDENDA. By signing below, we certify that the information submitted on this DD Form 2792 is complete and accurate. The EFMP is a program implemented by the United States Department of Defense and provides support and various services to U.S. military family members with special needs. This includes spouses, children, and dependent adults. The proper forms should be completed by a sponsor, spouse, primary care provider, or by school personnel. EFMP enrollment is available for service members in any military branch, and each branch of service is capable of providing a wide range of medical, educational, personnel, and family support functions. Military members enroll in the program if they have one or more family members with a diagnosed physical, intellectual, developmental, or psychological condition that needs specialized attention, medical care or educational services. To confirm enrollment, service members need to file DD 2792 and DD 2792-1 forms and submit them with all necessary attachments to an Army Medical Treatment Facility (MTF). The EFMP Case Coordinator will then conduct an administrative review of the provided forms and forwards them to the appropriate Regional Health Command (RHC). The RHC reviews the documents and determines eligibility. If the application is approved, the RHC downloads the data into the EFMP database on the Army Personnel Network. After that, the Case Coordinator will inform the Soldier about their successful enrollment. The first two pages of the form provide you with instructions for filling the form and a basic description of each of the sections. Enter the name of the Medical or Dental Treatment Facility, the Civilian provider who will be in charge of completing your enrollment or update in the fillable box on the first page of the actual form. Input the name of the family member enrolling in the program at the bottom of the same page. If you want to enroll a child, either the parent, the sponsor or an alternative guardian must provide their signature, state their relationship and date the page. If the person being enrolled is 18 and older, they must sign the form and describe their relationship status as SELF in the appropriate box. State the purpose of filing in Box 1. Provide your own personal identifying information and the information about the dependent. Then describe their medical needs in the appropriate Box on page 2. Most of the third page is to be filed by administrative personnel within the EFMP. Make sure that the name of the enrollee, the name of the sponsor and the last four digits of the sponsor's SSN at the top of every page. Pages 4 through 7 are to be filled by a qualified medical professional. After your health care provider has completed the DD Form 2792, review Box 11 for accuracy. You must certify the form with your signature and date it everything is accurate and complete. Pages 8 is only applicable if the enrolled family member was diagnosed with asthma or reactive airway disease. Pages 9 and 10 are applicable only in case if the enrolled family member has a mental health diagnosis. Page 11 is only applicable if the dependent has a disorder on the autism spectrum or significant developmental delays. These pages must only be completed by a qualified care provider. Enrollment should be updated every 3 years or upon any changes in the medical condition of the enrolled family member. Service members are advised to start the update process at least 90 days prior to the expiration date to ensure sufficient time for the updating process. Click the link above to download a fillable copy of the DD 2792 or fill it out digitally. Alternatively, you can visit your local EFMP office and ask a Family Case Worker to provide you with a physical copy of the form or have it faxed to you. 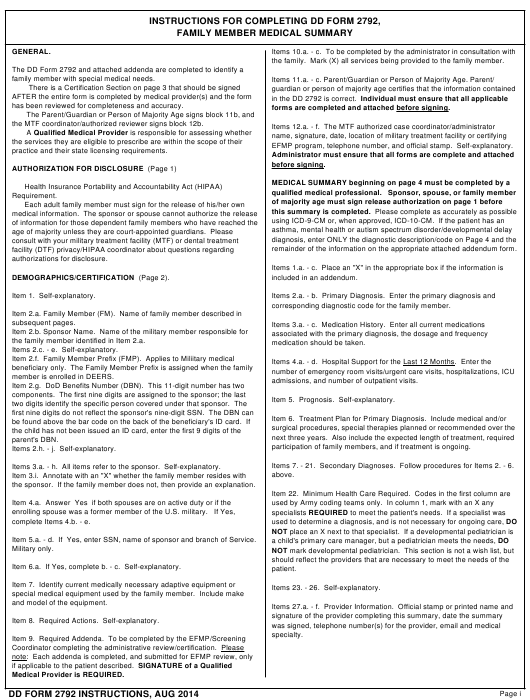 DA Form 7246, Exceptional Family Member Program (EFMP) Screening Questionnaire. AF Form 2523, Exceptional Family Member Program - Medical Information Form (EFMP-M).